A two thousands years old city and crossroad in the middle of the Syrian desert, Palmyra has been famous ever since a female monarch, Queen Zenobia, challenged the Roman emperor Aurlian and dominated lands East of the Mediterranean and Egypt for six years. The ruins of Palmyra give an idea of the important role this city played at its height; collecting taxes and defending the Eastern border of the Roman Empire from the Persians. Palmyra stands aside on oasis of palm trees. It offers a dramatic spectacle you will never see elsewhere. A dead piece of earth waiting to be submerged by the sands. And a medieval fortress on top of a hill, gloomy under an infinite blue sky. And at last, a skeleton of a city whitened by a ruthless sun, reminder of a great kingdom, that once dominated the Orient, and is now dead. The sunset of Palmyra is almost unreal. The shadows of the ruins seem to revive the old city every evening. Then this city disappears again in the desert night, clear and strangely calm. 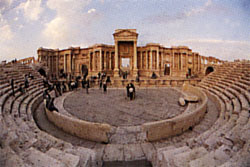 Many activities are possible in Palmyra, ranging from a pool side cocktail, very impressive in the starry nights of Palmyra, to a Bedouin dinner in the desert or a stroll on camels or horses. 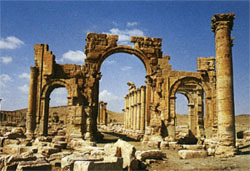 Excursions to the Palaces of the Desert, can be arranged, departing from Palmyra. 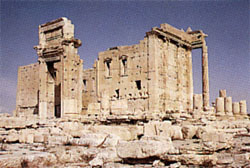 As for damascus and Aleppo, special Themes parties, cocktail and dinner parties can be arranged.